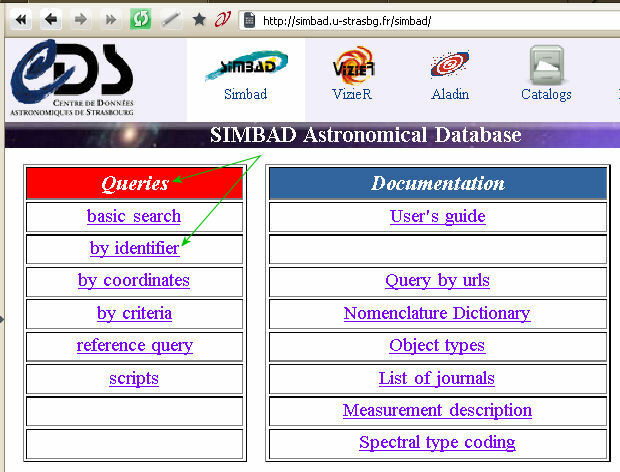 A Special Notice: Research throughout this web site has made use of the SIMBAD database, operated at CDS, Strasbourg, France and of The ALADIN interactive sky atlas. An Astronomical Database Providing Basic Data, Cross-Identifications, Bibliography and Measurements for Astronomical Objects Outside the Solar System. Please note that all image or data links open in the window above and as you've already noticed, that window frame remains static while this half of the page scrolls. As usual, links to outside web sites open in a new browser window unless otherwise noted. Now that we've covered the basics of searching with NED it's time to look at two other sites that work together: Simbad and Aladin. A third site that is also associated with these two is the VizieR Service. However, we'll cover the use of that resource in Part III of this series. Also, pleasekeep in mind that this guide is not all inclusive nor is it endorsed in any way by either SIMBAD or ALADIN. It is simply what it states itself to be: a Short Guide. It is based on my own years using these resources and in response to questions asked by others regarding resource site usage. Today we'll be using Galaxy NGC 4455 as our example. If you're unfamiliar with this galaxy don't worry, I picked this galaxy's NGC number at random and so am not familar with it either. But first, let's see if we can obtain some basic data regarding our target and we'll go from there. So, where is NGC 4455 and what is it's morphological type? Well, from the above image it appears to be a spiral-type galaxy and it's location...well, let's just head over to the SIMBAD web site right here and find out. 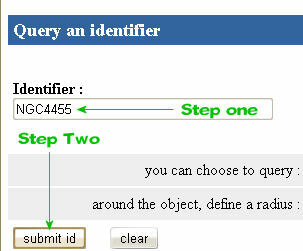 Once there you'll see a fairly stright forward menu display, a portion of which can view by |CLICKING HERE| The sections we're interested in are titled Queries and "by identifier" shown with green arrows. To view a larger image |Click Here| Clicking on the line "by identifier" will bring up the following menu, viewed by |CLICKING HERE| or view a larger image by |Clicking Here| If we type "NGC4455" into the box "Identifier:" then all one need do is click the button "Submit ID". After submitting our query on NGC 4455, you should see a screen that contains various astronomical information: Basic Data, Identifiers, Plots and Images, References, Measurements and External archives. [ C.D.S. - SIMBAD4 rel 1.105 - 2008.12.22CET21:25:18 ] ⇔ This line gives the date and time of our query request. So, now that we have a screen full of information let's take a look at each section of it individually. First, we see from the above screen shot that NGC 4455 is an emission-line galaxy with a morphological type of Sc/I D and located at [ International Celestial Reference System ] Right Ascension 12 28 44.12 & Declination +22 49 17.4 (red outlines); also note that the coordinates are given in the formats of FK5-Fifth Fundamental Catalog and older FK4-Bessel-Newcomb system and Galactic Coordinate System, GAL. We also know, from the basic data section, information about: Radial velocity / Redshift / cz (km/s 643  / z 0.002148 [0.000013] / cz 643.95 [3.90] ), Spectral type (none given but shown when available for any particular object), Morphological type: Sc/I D ~, Angular size (arcmin): 2.511 0.812 16 and Fluxes (1) : B 15.5 [~] D ( the galaxy's energy output based on a size and age comparative analysis )...cool, knowledge! Moving right along, let's look at the other sections of information we retrieved from SIMBAD. After using this service for many years one of the nice aspects of this layout is it's simplicity; most everything you might require for serious reference material or study is here in a single, short page of information, broken down into an easily understood format. Start by | CLICKING HERE |. In the above frame you now see a box entitled Identifiers (16) : indicating the number of different reference names for our galaxy. Some of the ID's may be familiar, others may not. Yet, they all have a common thread: they are all a reference source to a particular type of survey study conducted on our galaxy or a catalog type. For example, the identifier HIJASS J1228+22 refers to the HI Jodrell All-Sky Survey, a blind HI survey being conducted on the 76m Lovell telescope, at Jodrell Bank Observatory, Cheshire, UK. 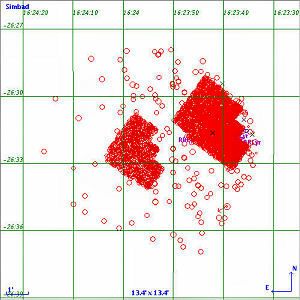 The survey aims to cover the whole of the Northern sky, north of Declination +25 degrees; LEDA 41066 from the catalogue of homogeneous parameters of galaxies and interfaced with HyperLeda, an information system for astronomy that is excellent; WAS 57 A moderate-dispersion objective prism survey for low-redshift emission-line galaxies; IRAS 12262+2305 & F12262+2305 [ Infrared Astronomical Satellite ] was a joint scientific project sponsored by the United Kingdom, the United States, and the Netherlands. IRAS' mission was to map the entire sky at infrared wavelengths. Following the links from this section alone can provide the researcher with plenty of data, from all types of surveys performed on any given object. I have found a good deal of informative text, abstracts and images, not to mention knowledge used on this site, just by following the references given in this one section alone. What that said, let us look to our next section, one I have often used not only on this web site but for educational projects as well, by | CLICKING HERE |. If you were looking for a single white dwarf star in all that ... well ... to put it another way, a 10 arcmin query of an area within M4 resulted in a listing of 5,255 individual objects! So, unless you are in need of a general listing you may wish to limit the area of your query. That said, let's make a plot of an area around NGC 4455 and see what comes up. First, due to the area of NGC 4455 (or angular size) in relation to the area we are plotting, we set our arcmin option to 6' square and clicked the "plot around" button which returned the following results viewed by | CLICKING HERE |. 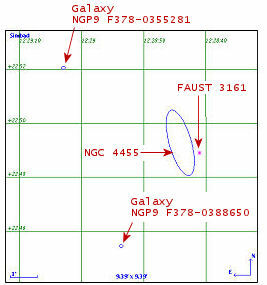 In the above image we not only see our galaxy NGC 4455 but three other stellar objects - 2 galaxies and a UV emission source - all of which are clickable points on this plot. On to the next step which is going to take us to the ALADIN web site's Sky Atlas. To do that simply | CLICK HERE | to return our previous image - good - and now we'll be clicking on that button titled Aladin previewer. To continue, please click the below link entitled "Part Two A Short Guide on Querying - the ALADIN Sky Atlas"
This ends PART I of our Short Guide on Querying. We will be returning to the SIMBAD web site for a brief discussion on the other query result options in the conclusion to this guide's section on SIMBAD and ALADIN. Thank you for stopping in!